The accepted abstracts and abstract book will be published on the conference website. Conference proceeding will be published in special issue of Current Applied Physics published by Elsevier having impact factor 2.05. Review papers are also welcome but potential authors (e.g., invited or keynote speakers) are required to submit a proposal for a review paper to the journal editors for prior approval. Please include the review title, abstract, the content in bullets, a note on the significance of the review topic, and a short note on your group expertise. All submitted papers will go through the standard review process of the journal. Current Applied Physics (Curr. Appl. Phys.) is a monthly published international journal covering all the fields of applied science investigating the physics of the advanced materials for future applications. Other areas covered: Experimental and theoretical aspects of advanced materials and devices dealing with synthesis or structural chemistry, physicaland electronic properties, photonics, engineering applications, and uniquely pertinent measurement or analytical techniques. 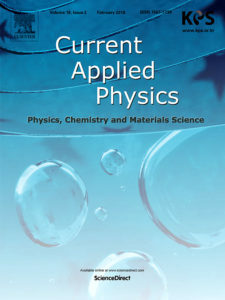 Current Applied Physics, published since 2001, overs physics, chemistry and materials science, including bio-materials, with their engineering aspects. It is a truly interdisciplinary journal opening a forum for scientists of all related fields, a unique point of the journal discriminating it from other worldwide and/or Pacific Rim applied physics journals.